Please note that this position is at our Circuit Street location in Roxbury, Massachusetts. Teaching 4-5 sections of English, with various separate preparations, depending upon the results of summer school and the final school schedule. Collaborate with the English department to plan lessons, create/update lesson plans, save all updates and creations to the City on a Hill server. Implement school wide systems, such as beginning of class routines, merits/demerits, writing across curriculum, as well as any additional academic initiatives implemented at the school or network level. Design and implement high quality assessment of student learning. Attend all Town Meetings, department day meetings, and weekly faculty meetings. Attend all grade level and IEP meetings of the students in all sections. Attend subject and/or grade level field trips as appropriate. Member of an assigned Professional Development Group and participant in City on a Hill’s Peer Observation Program. Collaborate with SpEd teachers and ESL teachers to ensure appropriate adjustments to curriculum, instruction, and assessment are implemented and attend Learning Network team meetings for all students in sections. Other duties as assigned by Principal or Vice Principal. Preliminary MA teaching certification or is working toward earning MA certification. Welcome to City on a Hill Charter School (Circuit Street)! CITY ON A HILL graduates responsible, resourceful, and respectful democratic citizens prepared for college and to advance community, culture, and commerce, and to compete in the 21st century. 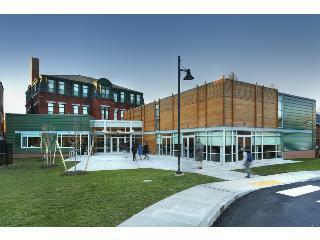 A 280-seat charter public high school in the Dudley Square neighborhood of Roxbury, MA. CoaH students are admitted by random lottery in the 9th grade only. For the 2012 lottery held in March, there were 880 applications for approximately 90 seats. City on a Hill students come to us from all across the city, but primarily come from the Dorchester, Hyde Park, Mattapan, and Roxbury neighborhoods of Boston. CoaH students like to be here: this year’s daily attendance rate is 94.3%. In 2011, when comparing growth from 8th grade to 10th grade on the math MCAS exam, CoaH came in fourth of the 339 high schools measured in Massachusetts. CoaH has been re-accredited by the New England Association of Schools and Colleges, and is currently the only accredited charter high school in Boston. Since the first graduating class of 1998, 100% of City on a Hill graduates have been accepted to college.